Shutters - An Open and Shut Case? Best of Both Worlds: Good Looks and Low Maintenance! Wood, vinyl, aluminum and metal, shutters add decorative accents to your home. Custom shutters combine the best of both worlds: attractive good looks and low maintenance. Traditional quality wood provides a natural solution with stable durability. For maximum performance consider new faux wood stylings of composite construction to enjoy the elegant appearance of shutters in any interior space - without worrying about warping, fading, chipping, or excessive wear. The look of your environment can take on an open and airy feeling with shutters when in the open position, while allowing an extreme amount of privacy and protection from the sun's harmful rays when closed. A simple tilt of the shutter can regulate the amount of light you want in your home, allowing you full control. 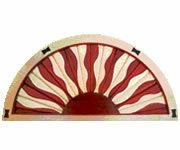 Shutter materials range from 1" louvers to 4" louvers. Both real wood and synthetic shutters are crafted with care and attention to provide beauty and style. They also offer a substantial increase in energy efficiency by reflecting heat during the summer and keeping the warmth inside during cold winter months. For your best choice, consult us - your window design professionals! We'll help you select from painted, stained, wood, or "faux" wood for your special application. For a job done correctly, our installation professional will determine the actual configuration and suggest the various options to maximize your privacy and sun control requirements. For that simple, sleek look, shutters can offer years of low maintenance beauty to your home. We will help you select the shutter styling perfect for your room - and your budget!